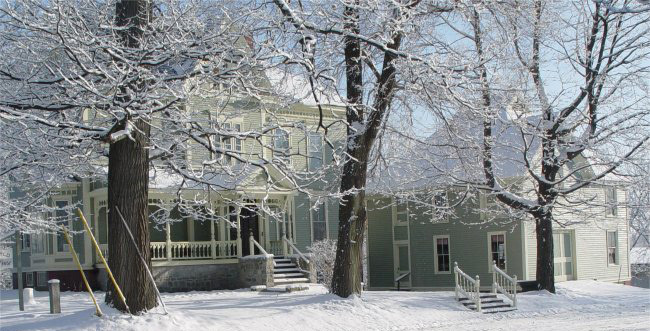 The Fairfield History House will be closed in December, January, and February, reopening the first Tuesday in March. The house will be open each Tuesday thereafter as well as the second Saturday of each month. Hours for both days are 10:00 to 3:00. During the winter, special tours may be arranged by calling Mark McPheters at 453-9823. Folks may also call Peggy (Tozier) Blair, at 426-8986. The mission of the Fairfield Historical Society is to record and preserve the history of the Town of Fairfield, Maine and its region. The purpose of the organization is to receive and compile historical papers which might otherwise be lost, to obtain articles pertaining to the town (tools, furniture, manuscripts, etc. ), to contact townspeople and help make them aware of our interest and concern about the preservation of these articles and of all articles given or sold to the town which might have historical value. We encourage gifts of a historical nature! Don't let anything in your attic go to the dump without calling the society. It might be just the photograph, letter, newspaper or artifact that would fill a gap in our collection. There are no residence requirements - anyone interested in the goals of the society is welcome. Members are encouraged to study and research local history and also to speak to groups about our purposes. The Cotton-Smith House, a Queen Anne Victorian, built in 1894 by John Cotton of the White Mountain Refrigerator Company, is listed in the National Register. The house was purchased by the FHS with a bequest from founding member Ray Tobey in 1983. Painted ceilings with a stenciled border found under a false ceiling have been restored to their former beauty. Honey maple woodwork is especially prevalent on the main stairs and entry. Victorian Furniture, including Gertrude Smith's piano. Victorian and Edwardian clothing, including historic wedding dresses. The Lawrence Collection: furniture and memorabilia of the Lawrence family, including three generations of family wedding dresses. Endowed by Mary Lawrence Halkyard. The Tobey Collection: furniture and accessories, historical and genealogical items. General collection of maps, photographs, and assorted documents dating back to the 1700's. Most documents pertain to the town of Fairfield but include the sheriff records for the entire area. Photograph Collection: Collection contains over 4000 photos of the area and its people. Copies of photos are available through Elm City Photo at elmcityphoto.com. You will need to obtain a photo ID number from us before going to Elm City. Primary and secondary sources are available at the History House. Research in the Fairfield Historcial Society's collections is available for free to members; non-members pay a small fee. For research inquires please contact us. Selected photographs relating to Fairfield history are available from Elm City Photo. A brief history of the town is available on the Town of Fairfield website.